The 26-year-old opener completed his nine-month suspension for cheating in late December and has since played Twenty20 cricket for the Perth Scorchers in the Big Bash League. But his outing for Western Australia against New South Wales in the Sheffield Shield in Sydney was his maiden first-class match since the infamous 'sandpapergate' in Cape Town almost a year ago that rocked the game. Bancroft was a measure of concentration and discipline as he played the anchor role to be 73 not out overnight and completed his patient ton on Sunday, smashing eight fours and three sixes in his 358-ball innings as his team collapsed around him. It helped steer Western Australia to 279 all out. With the Ashes series against England looming this year, it was a timely knock with Australia struggling over the summer to find a consistent Test opener. 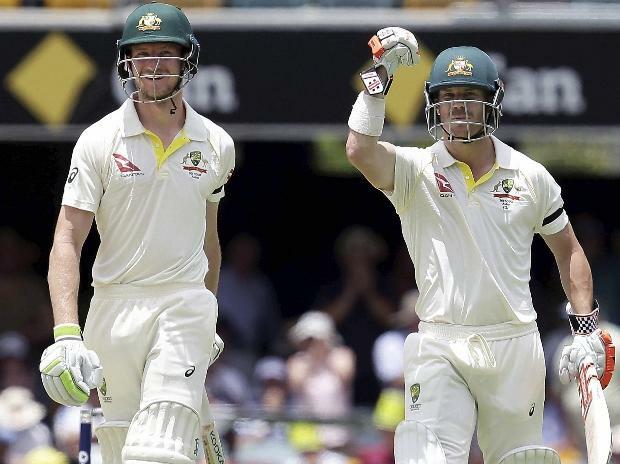 They tried Aaron Finch, Marcus Harris, and Joe Burns to varying degrees of success ahead of the return of regular opener Warner and former Test skipper Steve Smith. The pair are eligible to play again in late March after their one-year bans for the same ball-tampering incident expire. In an explosive interview during the Boxing Day Test against India in December, Bancroft alleged it was Warner who asked him to alter the ball in South Africa. Some pundits suggested he had thrown Warner "under the bus" and that their relationship was now untenable. But Bancroft insisted they spoke regularly and had been supporting each other. "Yeah, I've spoken to Dave... I think all of us, including Dave, have been really challenged through this period of time," he told broadcaster ABC on Saturday evening. "I know that all three of us have really stuck by each other and looked after each other well. I guess moving forward there will be great lessons for all of us, including Dave. "That's something we've all shared with each other and something I've certainly shared with Dave when we've communicated throughout this entire journey." Despite being criticised for the timing of his Boxing Day interview, Bancroft -- who will play for Durham in the English summer to further his Ashes chances -- said he had no regrets. "There were some really powerful lessons I learned through my journey that I wanted others to connect and to share with," he said. "If other people were triggered by that, I guess that's their battle to face. "But if I was able to touch people through some parts of my journey, and to help them I guess break through (in) their lives, that was my sole intention for that," Bancroft said.